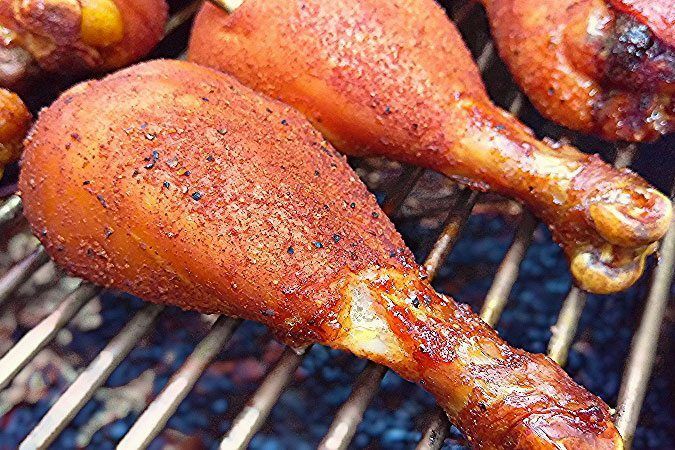 A whole barbecued chicken makes for a great family meal or dinner for 2 with plenty of leftovers. 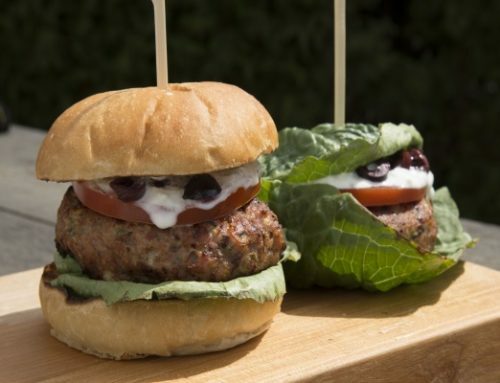 But getting white and dark meats to cook properly while maintaining juicy meat and a crispy skin can be a challenge that causes many to take it off their menu. 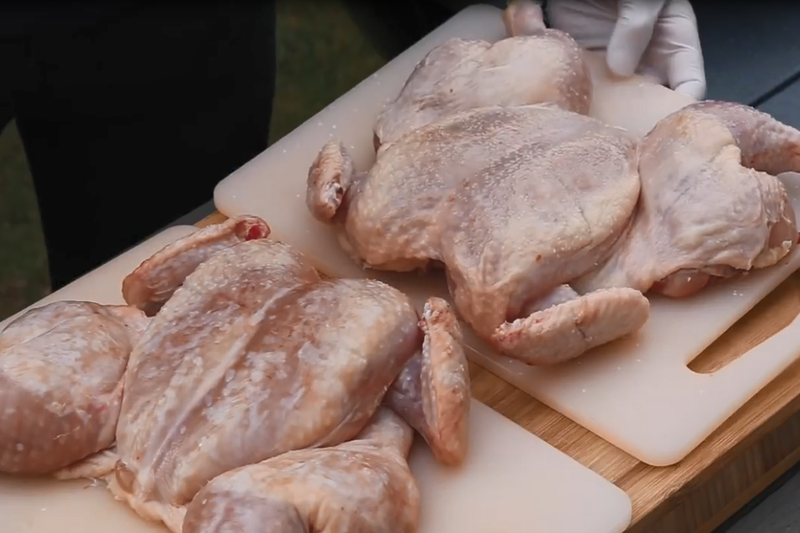 Our recipe is going to teach you a couple of very simple techniques to ensure your next whole bird (and every one after that) is perfectly cooked. 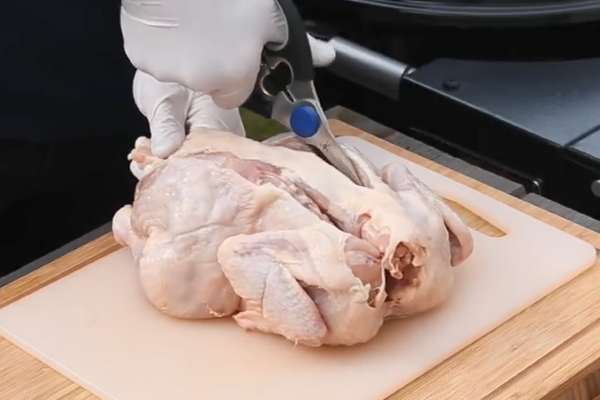 To start off you’ll need a whole chicken and a GOOD pair of kitchen or poultry shears. We’re going to spatchcock, or butterfly, the bird for the cook. This simply means we cut out the backbone of the chicken and break the breastbone. This will flatten the bird and open up more surface to cooking, which helps cook the bird faster and more evenly. We strongly recommend using shears instead of a knife because it’s so much easier and safer. Cut through the bones on both sides of the spine for its entire length. Once the backbone is removed flip the chicken breast-side up. With the palm of your hand press down firmly on the breastbone, splitting the rib cage so the bird lays flat. When you hear and/or feel the breastbone crack you’ll know the spatchcock process is complete. Complete prep by removing any excess fat flaps and the wing tips. Once spatchcocked, we are going to dry brine the chicken overnight. Trust us, your patience and planning will be rewarded! Sprinkle ½ tsp of Kosher salt per lb of meat all over the chicken, skin side and underneath. Don’t worry about getting under the skin – the salt will penetrate through the skin and into the meat. 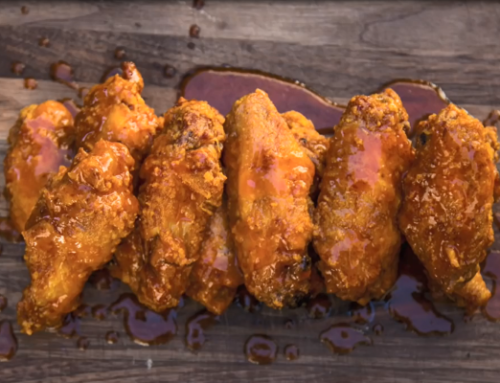 The salt dries the skin at the same time it penetrates, which makes dry brining a key technique to achieve crispy skin. After salting place the chicken in the fridge, uncovered, overnight until ready to cook. After an overnight stay in the fridge the skin will appear drier and darker than before it was salted it. The photo gallery below contains a comparison shot of a freshly spatchcocked chicken (back right) vs. one that was dry brined overnight (front left). Just before putting it on the grill season the bird with your rub of choice. 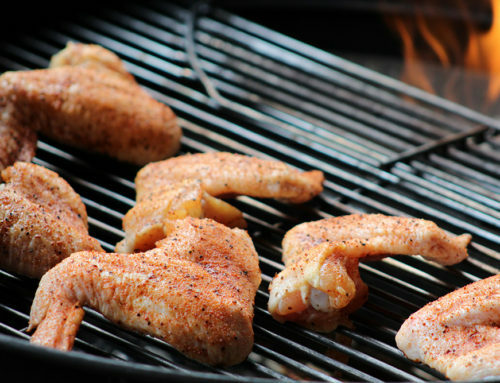 Remember to avoid salt-containing rubs since the chicken is already brined. A couple of our favorites are Memphis Dust and Simon and Garfunkel. We’re going to cook the chicken at 325˚ to 350˚ F, so follow the lighting instructions for a long duration hot & fast cook. Add your favorite smoke wood, if desired, to the coals. We like pecan or apple. Get the wood onto the coals early to ensure good smoke flavor throughout the cook. 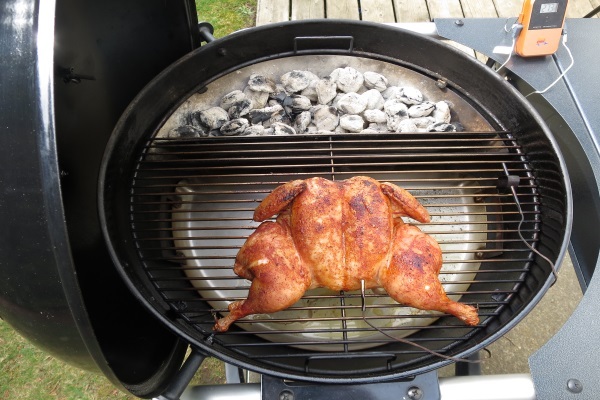 Poultry absorbs smoke much more readily than pork or beef so start with a small wood chunk. 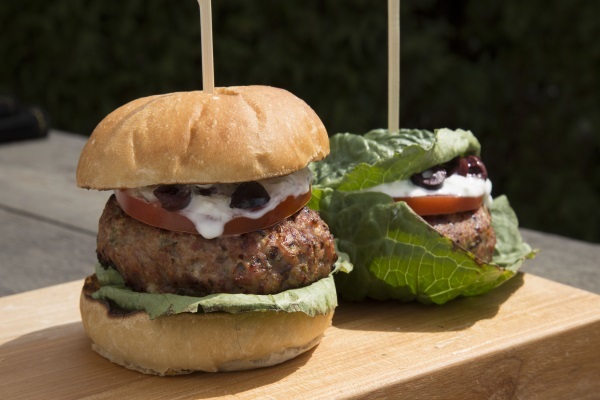 It is also unforgiving of dirty smoke so be sure you’re smoke looks thin white or thin blue before you add the meat. 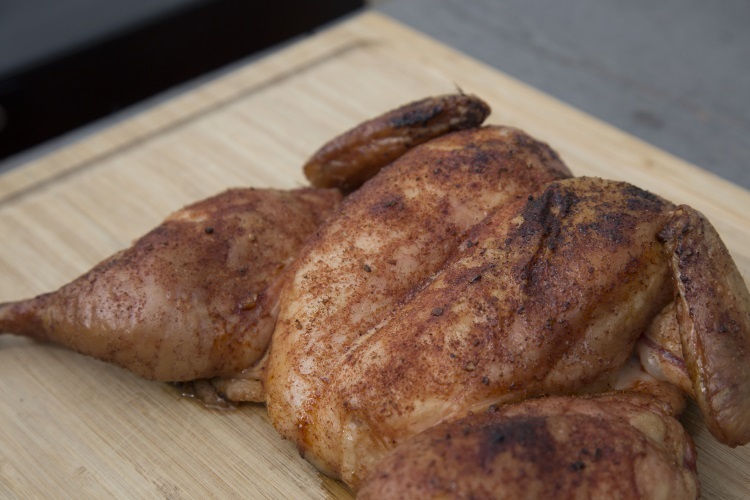 Place the chicken breast side up and as flat as possible onto the indirect side of the grill. This will help cook the chicken evenly. Face the legs away from the Slow ‘N Sear. 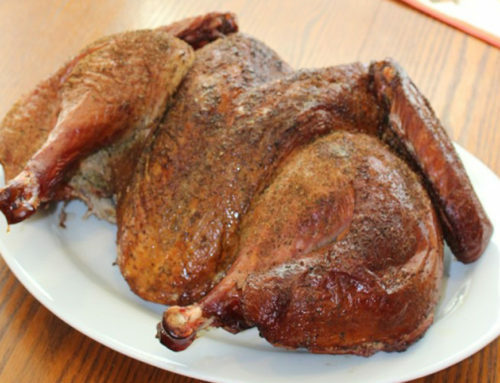 The legs and thighs will cook slightly faster than the breast because they are smaller, but this is OK since we want the legs/thighs to cook to a higher final temperature (175˚ F or higher) than the breast meat (160˚ F). Place a digital thermometer into the thickest part of the breast to monitor the internal temperature of the chicken as it cooks. Here comes the hard part. We’re going to leave the lid alone and not open it until the breast meat reaches 110 degrees. 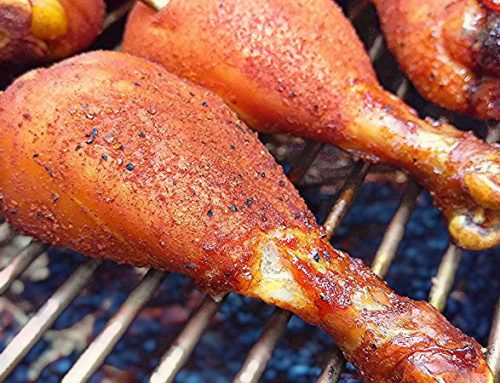 When it hits 110˚ F, use an instant read thermometer to make sure temperatures are progressing in the dark meat as we’d expect them to, which is about 125˚ F to 135˚ F. If dark meat temperatures are not trending higher than the breast, rotate the chicken so the legs and thighs are closer to the Slow ‘N Sear. Continue cooking until the breast meat hits 160˚ and the thighs are 175˚ F or higher. 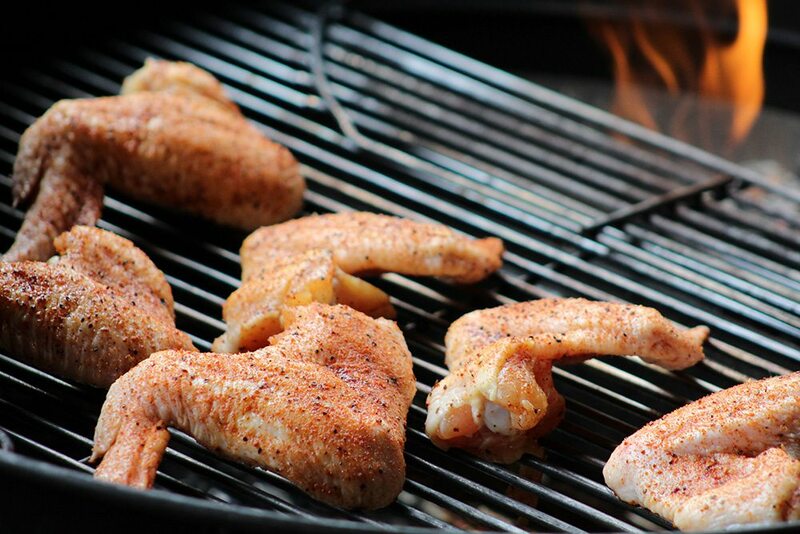 When the meat is done, remove the chicken from the grill and let it rest for a few minutes before serving. (Do not cover with foil as this will add back moisture to the crispy skin we worked so hard to achieve!) 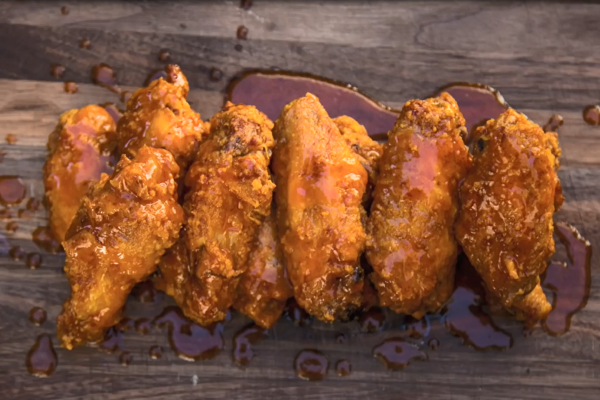 Get ready for “ooohs” and “aaaahs” as you hear the crunch through the crispy skin and make sure you have plenty of napkins ready – this bird will be juicy! SnS. . the breast was done beautifully but the thigh was not done and the area on the indirect side opposite the fire was actually a little cold. Probably if I had cooked it an hour longer it would have been done but I did not want dry out the breast. I will work on it. An excellent recipe, clearest and most helpful of those I found for my first spatchcock cook. Weber 22, SnS, DnG, a full chimney of Rockwood lump, 33 deg ambient, Smoke (sorry!) to monitor breast and grate temps. 4# bird, 6 hr dry brine, Simon & Garfunkel rub. Dome thermometer (over SnS) pegged at 600+ when bird went on; Smoke grate temp peaked at 477 16 minutes in, left bird in place per recipe and pulled at 45 minutes, 428 grate temp, 160 breast IT. 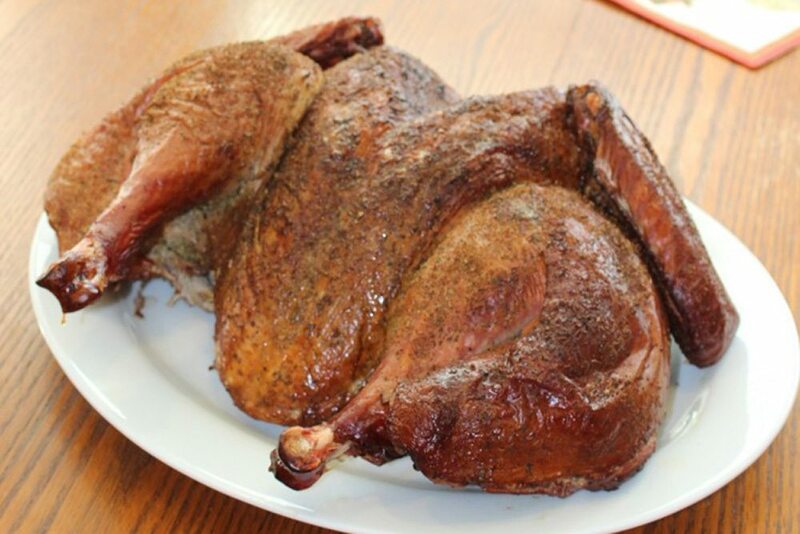 Skin not crisp, unfortunately, but bird was perfectly done( white and dark meat), juicy and flavorful. Will lightly oil skin next time, else leave well enough alone. Highly recommend this recipe and boosting temp as well! This was a very educational clip.